FREQUENTLY ASKED TRAINING QUESTION: How do I help my horse overcome his fear, anxiety or phobia? In the horse world, fears, anxieties, and phobias are rarely taken seriously. Often a behaviour that is motivated by fear is attributed to bad character “There is nothing wrong with him! He is just naughty and likes to have his way!” or to a dominance/respect issue “He doesn’t trust you as his leader!” Not only are all of these misinterpretations anthropomorphic and unscientific, but they also cause further harm to the animals, as trainers and owners proceed to use flooding and punishment in an attempt to remove the unwanted behaviour. What are fears, anxieties, and phobias? A fear is characterised by an unpleasant emotion caused by the threat of danger or pain. The response (behavioural, autonomic, etc.) dissipates once the threat is gone. Fears must be taken seriously; early recognition is the key to preventing the animal from possibly become anxious or phobic. Anxiety is a generalised state of apprehension in anticipation of a fear-causing event/stimuli. Anxiety can occur without the actual presence of the threat. For example, a horse that suffers from separation anxiety disorder may experience anxiety when he sees his bridle. In this case the bridle is associated with being taken away from other horses. A phobia is an extremely severe and persistent fear caused by a real or anticipated threat. Phobias have a more important and lasting impact on the animal’s life than fears. For example, the horse may partially or completely give up on some behaviours (e.g. body care, play, exploration) and even the behaviours that cannot be given up may be affected (e.g. poor quality of sleep) due to the horse not feeling safe. The phobia may cause the horse to injure himself and others (owner included). Step 2: Assess your management. Some changes in the horse environment may help to reduce anxiety (e.g. if your horse is anxious about hacking out, bringing another horse he likes along with him might help.) Or make the horse less fearful without the need for training (e.g. horses that are poorly socialised, with little to no turn-out with a permanent herd are more likely to be fearful). Step 3: Learn about the tools that are available to you and ask for the guidance (or full involvement) of a professional. (More about this further down.) 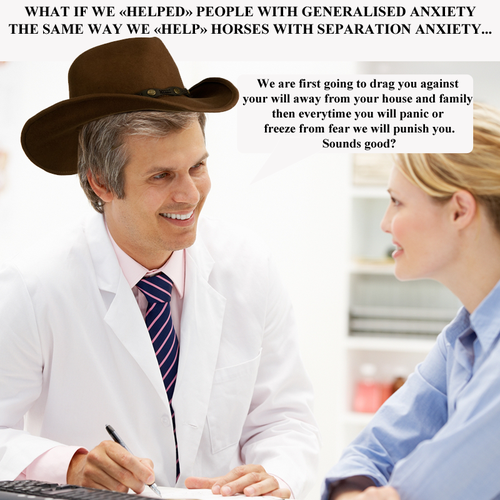 I would recommend asking help from an equine behaviourist when it comes to anxiety and phobias. A real-life example of phobia in a horse: Penny. 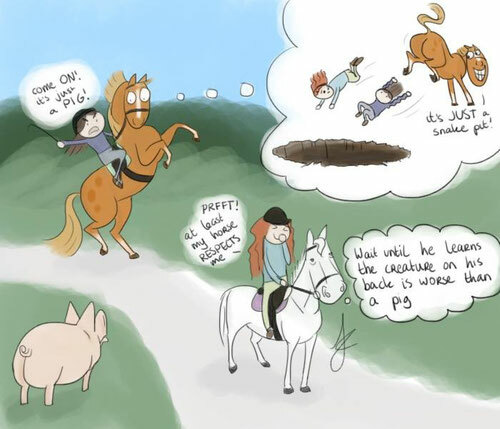 Penny is the horse in the above picture. In 2014 she suffered from swinophobia, which is the fear of pigs. When Penny first encountered pigs she bolted and didn’t stop for the first 500 yards. 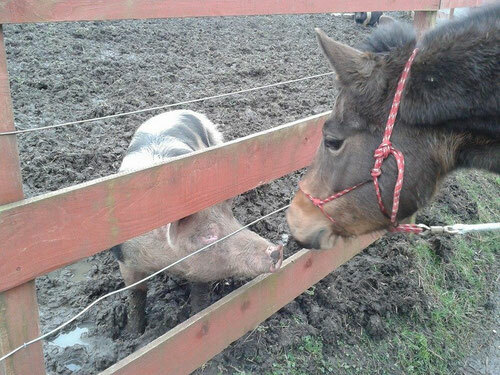 Penny’s fear of pigs generalised to anything resembling a pig: dogs, sheep, and cattle. When encountering a dog she would start trembling, then freeze and then flee. Penny also started to worry as soon as she left the premises. I first taught to the owner the basic skills that she would need during the process (targeting, reinforcement delivery, etc.). Then we established a hierarchy of fears (see the next section) and worked through it using systematic desensitisation and counter conditioning. Hierarchy of fears: Establishing a hierarchy of fears means rating your horse’s fears from less fearful to most fearful. This helps you build a behaviour modification plan and avoid flooding (more about this further down). 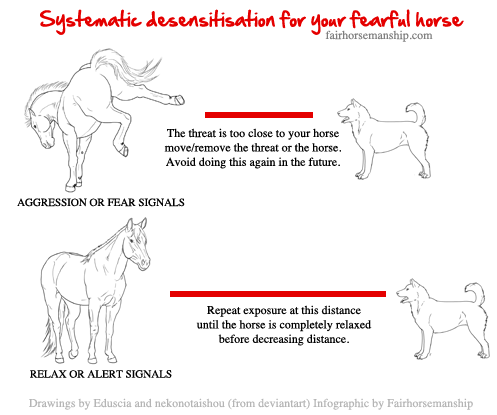 Systematic desensitisation: This involves gradually exposing the animal to a less intense version of his fear in such a way that the fear response isn’t triggered. A less threatening version of the stimulus can be creating by making it smaller, slower, or still farther away from the animal, quieter, or silent, etc. When the animal is habituated to this less threatening stimulus, you gradually make the stimulus stronger, but still without provoking a fear response. For example, if your horse is afraid of vehicles, you will start with the vehicle that is less threatening for your horse (e.g. bike) and keep it still at a distance. Once the horse has habituated to seeing the bike at a distance, you can progressively bring the bike closer or the horse closer to the bike (depending on the individual and the situation). Then you will desensitise your horse to the bike in movement, perhaps by having someone guiding it/riding it away from the horse. If the horse shows no fear you will then get the bike to travel parallel to the horse, then toward the horse, and finally around the horse. Distance between the horse and the bike will progressively be decreased, yet without provoking fear in the horse. Similar steps will be taken to habituate the horse to the sound of the bicycle bell. You will then move to a more threatening vehicle and so on. . You will also need to work on context: just because your horse doesn’t show fear when he sees a bike in his field doesn't mean he won’t feel fearful when seeing one out on the road. Counter conditioning: This involves changing the unwanted response (e.g. fear) to a stimulus by associating the stimulus with positive things. Systematic desensitisation and counter conditioning are often used together as it is often impossible to create positive associations while exposing an individual to a stimulus that he actively fear. /!\ Important /!\ When contacting a professional trainer/behaviourist for your horse's fears/anxiety/phobia, be sure to enquire about his or her methods. Stick with a professional who has a scientific knowledge and understanding of what fears, anxieties, and phobias are. Be wary of the use of euphemisms and term with subjective meaning such as force free, natural, pressure/release. Flooding: This is the repeated presentation of an aversive stimulus in a context where the individual cannot escape. Flooding is faster than systematic desensitisation but is less efficient and highly traumatic. Flooding is now considered unethical in the treatment of humans and therefore should be considered unethical for animals too, especially as they cannot give consent. Flooding causes brain fatigue and the individual either become shut down (gives up) or highly phobic. Many popular trainers use flooding and call it “desensitisation” or “habituation”. However, in actual desensitisation/habituation the stimulus that is considered threatening should not cause any harm or fear to the horse. Positive punishment: This is the addition of an aversive stimulus following an unwanted behaviour in order to weaken it. Positive punishment is not an efficient or ethical solution as it reinforces the fear/anxiety. The horse is also likely to develop a fear of the person inflicting the punishment. Trigger stacking: Trigger stacking happens when multiple stressors or stressful events occur at the same time. It causes the horse to try to escape or if escape is prevented aggression may occur. For further help with your horse's fears check out my services.